ThisM96X TV box boasts high performance. It is operated by the Amlogic S912 CPU and Mali-T820MP3 GPU, processing data quickly. With Bluetooth 4.0, 2.4GHz + 5GHz dual-band WiFi and 1000M ethernet network, it could access the network at higher speed. Based on Android 7.1, M96X TV box works steadily. ● Support Skype chatting, Picasa, Youtube, Flicker, Facebook, Online movies, etc. Want to be notified when the M96X PLUS TV BOX gets even cheaper? Make sure you snag the best price by entering your email below. We'll email you when the price drops, free! We're tracking the price of the M96X PLUS TV BOX every day so you know if that deal is really a steal! Check back for to check the best price for this product - and whether its current sale price is really the cheapest it's been! 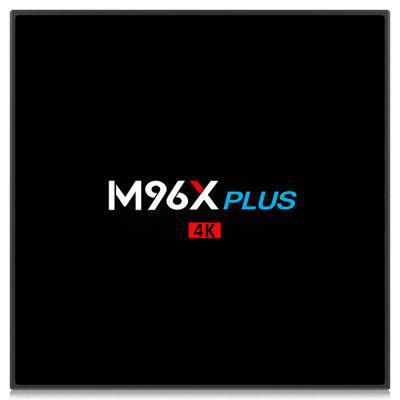 No M96X PLUS TV BOX coupons found!